Detailed plans for a new state-of-the-art training hub in Shropshire have been unveiled for the first time, with the aim of supporting ‘2020 learners by 2020’. More than 100 local businesses and stakeholders attended the £3m Marches Centre of Manufacturing & Technology (MCMT) launch event in Bridgnorth to find out how they can play their role in helping it reverse the region’s skills and competency gaps. Supported by the Marches Local Enterprise Partnership, work will start on fitting out the 36,000 sq ft building on the Stanmore Industrial Estate in January, with exciting plans in place to create dedicated fabrication, foundry, lathe, metrology, milling, robotics and vehicle trimming sections, as well as a specialist CNC Zone and spray booth/mixing capabilities. There will also be an auditorium lecture theatre, bespoke learning environments, 5 vehicle ramps and a rolling road test facility. 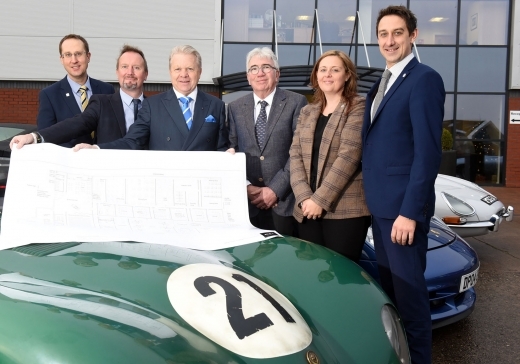 The Marches Centre of Manufacturing & Technology has received £1.9m of funding from the Marches LEP to bring the concept into reality, with £1.1m of private funding already pledged by the consortium. Additional sponsorship and business engagement will look to bring the budget to over £4m. Classic Motor Cars was founded in 1993 and has built a reputation for car restoration to world-class standards. Staffed by a highly experienced team of engineers and technicians, it operates from modern purpose built premises in Bridgnorth. Some 50 to 60 cars from varied marques, such as Jaguar, Aston Martin, Ferrari, Bugatti, and Lancia, can be found in the workshops every month for general servicing, upgrades, accident repairs, repaints, full restorations and other services. Founded in 1946, Grainger & Worrall is the world’s leading total castings solutions provider. The company provides an unrivalled production capability, delivering groundbreaking industry solutions for leading companies, including Bentley, Porsche and Aston Martin. Working across the automotive, commercial vehicle, motorsport, aerospace and defence sectors, Grainger & Worrall continues to lead the way in technical excellence, renowned worldwide for exceptional quality, service and exceptional innovation. The firm, which exports 55% of its products overseas, employs 600 people in Bridgnorth and boasts an annual turnover of approximately £50m. In-Comm Training and Business Services has been offering industry and commerce a wide range of training and business solutions for 34 years. The Aldridge-based firm has invested more than £700,000 into extending its Black Country and Shrewsbury academies in the last year and will now be able to offer apprenticeships for more than 100 young people annually…a 60% increase on 2016 intake. The long-term vision is to grow the business to £4.2m by 2020, increasing the workforce to 60 staff across a number of Training Academies in the Midlands. Established nearly 50 years ago, Salop Design & Engineering Ltd is one of the leading metal pressing and assembly providers in the UK. The company is based in a 60,000 sq ft facility in Shrewsbury, offering a global client base access to mechanical, progression, hydraulic and transfer presses, up to 1000 tonne. Recent investment has seen the installation of two state-of-the-art powder coating lines and the launch of its own haulage firm, all designed to increase its ability to provide a one-stop shop for pressing and coating needs. Salop Design & Engineering is accredited to TS16949 quality standards ensuring it offers world class quality, cost and delivery performance to customers in automotive and beyond.